The Missouri Department of Conservation has added 16 new conservation areas to a list of regions where hunters must use nontoxic shot. Lead was removed from most consumer products, like pencils and pipes, long ago. There’s still one product where lead is used routinely — ammunition. This final holdout is becoming more heavily regulated, however. Beginning this spring, hunters in Missouri will no longer be allowed to use lead shot in specific conservation areas across the state. State officials say the rules are meant to protect wildlife from lead poisoning. Unlike bullets, shotgun shells are filled with small pellets — often made of lead — that scatter across a large area. Some birds, like ducks and geese, may mistake the pellets for small stones, which they eat to help grind up their food. Doves that consumed lead shot during a Missouri Department of Conservation research study. 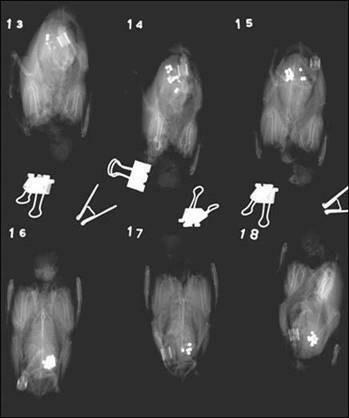 The ammunition, which appears as white dots in the x-ray, is concentrated in the gizzard of the doves. Eagles and other bird species may also scavenge animal remains and accidentally ingest lead shot or bullet fragments. Lead exposure is the leading cause of death for endangered California condors, according to the U.S. Fish and Wildlife Service. But for smaller species, like songbirds, it’s difficult to estimate how many individuals are dying from lead poisoning, said Rebecka Brasso, an ecologist at Weber State University in Utah. Another big question is whether lead has long-term negative effects on animal species — like changes in behavior and reproduction. In one lab study, female pigeons that ate a single 95-milligram lead pellet laid smaller eggs and had smaller babies than pigeons that were not exposed to lead. For reference, a U.S. penny weighs about the same as 25 of those lead pellets. Few studies have tried to measure how lead is affecting birds in the wild, said Brasso, in part because it’s very difficult and expensive to do. 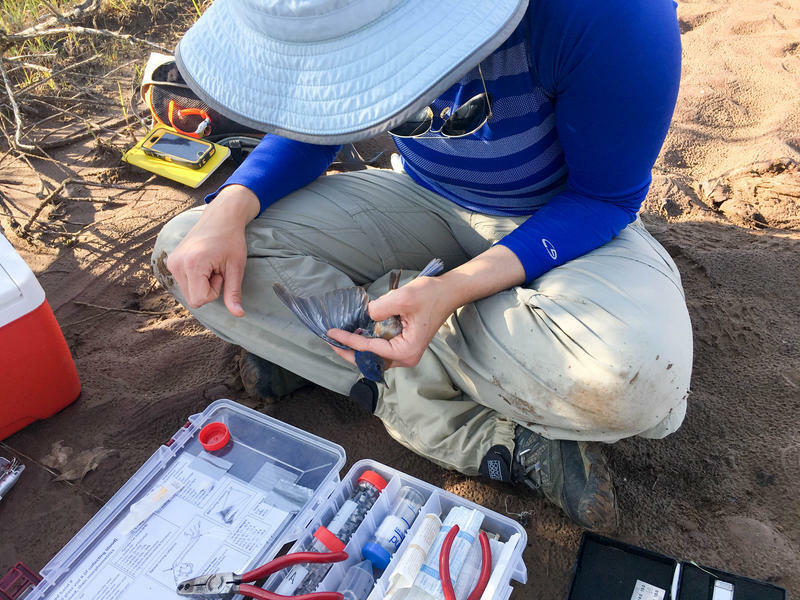 Avian toxicologist Rebecka Brasso recently led a three-year study in Missouri's Old Lead Belt to understand how lead contamination affects songbird reproduction. Here, graduate student Kathy Hixson prepares to draw blood from a male bluebird at the Madison County Mines Superfund Site in Fredericktown, Missouri. Brasso recently led a three-year study in the Southeast Missouri Lead District — once one of the largest lead mining operations in the world — to understand how lead contamination affects songbird reproduction. The regulation of lead shot is not new. Under federal law, waterfowl hunters have been required to use nontoxic, lead-free shot since 1991. In Missouri, lead shot has been banned from specific conservation areas for years, including Columbia Bottom in north St. Louis County. Last August, the Missouri Department of Conservation added 16 conservation areas where hunters must use nontoxic shot — bringing the total number to 37. The new regulations went into effect March 1, ahead of the spring turkey season. 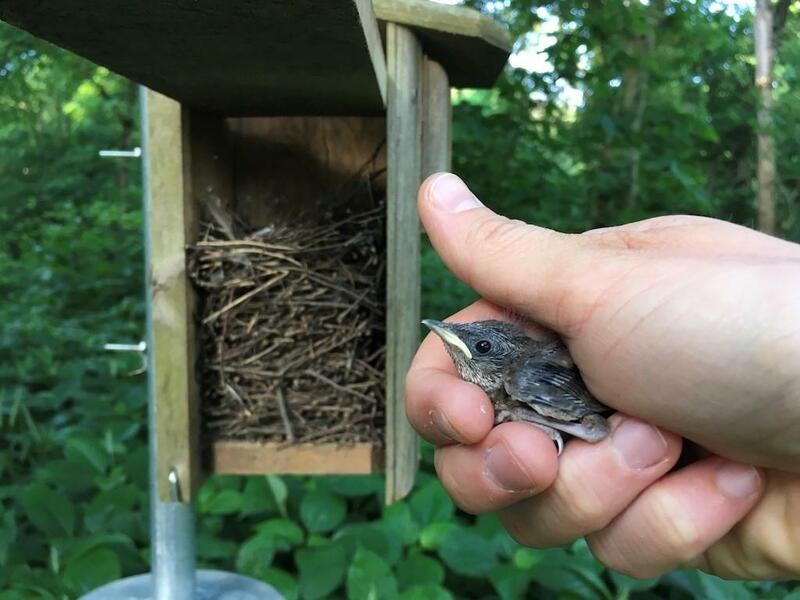 Brasso's research team followed the reproductive success of a half dozen songbird species, like this nestling house wren, in regions of southeast Missouri with high levels of lead contamination. But some hunters have been reluctant to give up their lead shot. Schroer said hunters have cited a range of reasons why they prefer to use lead shot, from the perceived ineffectiveness of nontoxic alternatives to stockpiles of lead shot that they want to use. A complete list of approved nontoxic shot, as well as restricted conservation areas, can be found on the Missouri Department of Conservation website. In Fredericktown, Missouri, three women walked towards what looked like a Martian landscape.